Reva 60 pack – front view. Kelty Reva 60 backpack for women is a pack from a completely new series launched by Kelty in the beginning of 2017. It includes packs of 45 and 60 liters, and also packs for men of 50 liters and 65 liters under the name Revol. At the moment of writing this text, the only place where this pack is available is Amazon. Even if you visit Kelty’s site, you will not find it there. This will surely change very soon. 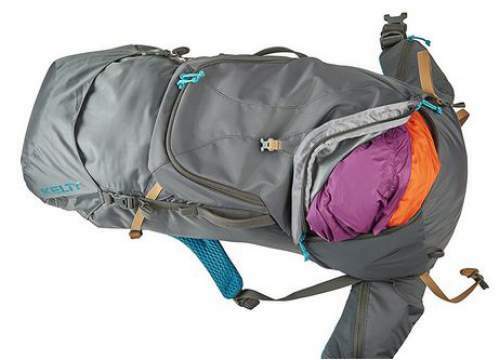 Kelty has built many great packs in this size range, but Reva 60 is quite different. This is a very minimalist design with many features missing. So do not expect anything similar to their packs from the Coyote, Red Cloud, and Catalyst series. The volume of this pack is 3650 cubic inches (60 liters), so this is a big pack, yet its weight is not so bad, 4 lb 1 oz (1.84 kg) only. 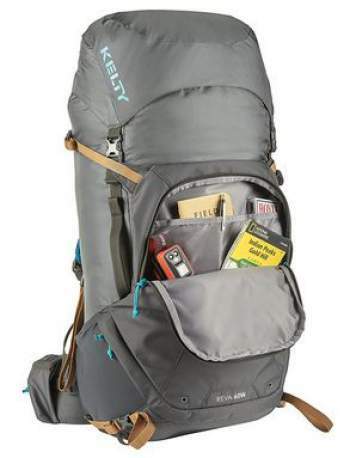 As you may realize if you follow the links above, this pack is considerably lighter than Kelty’s Catalyst 65 and Coyote 70, though it is indeed smaller. The side view showing the side straps and the mesh pockets. The suspension system with a pleasant padding. The suspension system of the pack is based on a lightweight peripheral aluminum frame and an HDPE frame sheet. Since this is a women’s specific design, the padding is very generous, just see te images, and it is designed to accommodate a female body shape. The harness is adjustable and it fits torso sizes in the range 14.5 – 18.5 inches (37 – 47 cm). 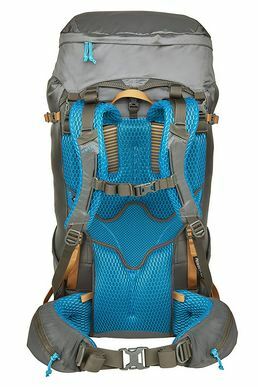 The torso length is easily adjusted through Kelty’s original PerfectFIT suspension system. This adjustment is done with the pack on your back, for this purpose you have the two orange color straps visible in the picture below. The hip belt is with what they call the Kinesis system, this is a pivoting system introduced here so that the pack follows and mirrors your body movements. The orange straps as a part of the PerfectFit system. The short pull loops for lumbar adjustment are also visible. From the images, you realize that this is a top loading pack. There is no extra front access, but I do not see this as an issue. There is a bottom compartment and its zipper is a small unique detail. As you see, it is not the usual inverted U-shape, see the picture below. In total, there are 7 pockets: 2 zippered pockets are on the hip belt, two stretch pockets are on the sides, one zippered pocket is in the lid, one zippered pocket with the organization is on the front, and behind it, there is yet another shove-it pocket. The bottom compartment with a unique U-shaped entrance. On both sides you have a carry handle, there are trekking pole loops on the bottom and 4 additional webbing loops to attach things on the bottom. The pack is with a separate external compartment for a water bladder. The compression straps are a bit puzzling for me. I have expressed the same opinion in the case of the Revol 50 pack for men. 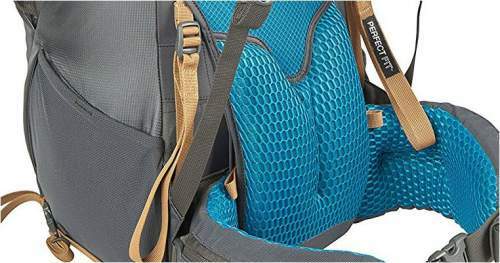 The upper side straps are too far from the stretch mesh pockets, see the picture above, so only very elongated objects stored in these side pockets can be fixed with the upper side straps. You would not be able to do this with the usual tent poles, or even with collapsible walking poles which consist of 3 or 4 pieces. On the other hand, the stretch mesh pockets are without any straps. This is not an optimal design, you cannot secure objects stored there. The “bottom” straps are practically on the sides, below the stretch mesh pockets, not the best solution. The pack offers lumbar adjustment. There are two pull loops on the back to find the best position for your body shape. This can be done with the pack on your back. This new system is available only in Kelty’s Revol and Reva series. In this case, you have a sort of a parallel moving system in the hip belt. The meaning of this is that the two sides of the hip belt operate individually. Roughly speaking, when one side goes up, the other side goes down. In such a way the hip belt adjusts to your body movement in an optimal way. I do not remember seeing anything similar in other packs. 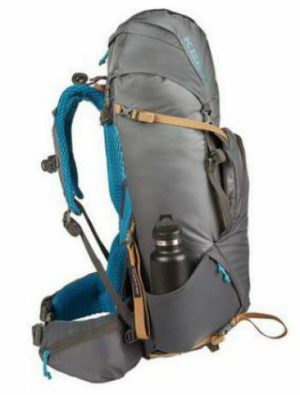 So as you see, Kelty does not stop surprising us with innovations and unique features in their packs. Great padding throughout the harness and hip belt. There is also the issue of compression straps mentioned above. My objections are the matter of preference. Volume: 3650 cub in (60 L). Weight: 4.06 lb (1.84 kg). Load capacity: 50 lb (23 kg). Size (L x W x D): 28 x 12 x 10 in (71 x 30 x 25 cm). – Body fabric: Poly 200D 3 Line Honeycomb Ripstop. – Secondary fabric: Poly 420D Small Back Stafford. – Frame: aluminum + HDPE. Torso fit: 14.5 – 18.5 in (37 – 47 cm). Dual stretch mesh water bottle pockets. 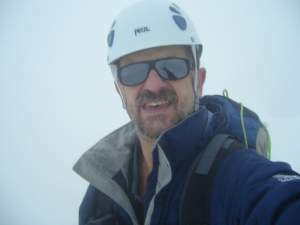 Ice axe and trekking pole loops. The approximate prices at the moment of writing this text for the three packs in the table are, respectively, $220, 220, 150. For updates please follow the links. With this, I conclude my short review of the Kelty Reva 60 backpack for women. This is a reliable tool which surely has its place on the market. I would say that the padding is one of the best features of this pack, it is so pleasant and visually attractive. But you should know that a very similar padding is available in several other packs from Kelty, like the Coyote 70, and in Redwing 50. If you need a smaller pack, please check this Reva 45 liters from the same series. Another standout feature unique to this series only is the kinesis hip belt system. There is nothing similar to this on the market. If you feel that this pack is not for you, please check the Catalyst 65 which is described in detail in the site, and the new Coyote 60 for women launched in 2017. See also my list of new backpacks for women in 2017. As I mentioned above, this pack is a part of a series which has a parallel version for men. So in my another text, you can read about the Revol 50 pack for men, with practically the same basic features, and the Revol 65 as well. Thank you for reading. In the case of questions and comments, please use the comment box below. Have a nice day.